Just a few suggestions to help you surf our Internet site. The site includes 7 sections: The National Site that you reached when you entered http://bellpensionersgroup.ca where all the information of interest to the 10 000 members of the seven (7) regional chapters will be found, as well as action undertaken by the executive and the various National committees on behalf of all the members. Information specific and pertinent to the 6 different chapters (Montreal, Quebec, Télébec, Ottawa, Toronto, Southwestern Ontario and Aliant Atlantic) will be found under each of the sites which you can access by cliking on the picture of the city or region when you arrive at the National Bell Pensioners Group site. Many segments are accessible by cliking on the tabs at the top of the page. For example: to reach the Bell Benefits site, click on LINKS, then click on the Bell Canada - Benefits link, enter your employee number in the "ID number" box, click on English and you will enter the Benefits site. We suggest that you consult the National site and the Montreal chapter site on a regular basis since news and notices are added on a continual basis. If you are a Bell pensioner and are not yet a BPG member, we urge you to join the 10 000 ex-colleagues who are already members. All you have to do is to complete the Application Form which is available under the BECOME A MEMBER tab. We must maintain solid representation in order to be heard by Bell, government bodies and other organizations involved in pension plans in order to fulfill our mandate. We need your support. The responsible for recruitment for the Montreal Chapter recently sent a special bulletin to all members soliciting their help to recruit new members. Did you attend the 2018 AGM? 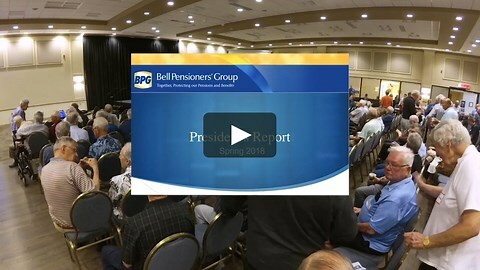 In case you missed the 2018 Annual General Meeting, you can view a video of the "President's Message", presented by Patte Seaton, President of the Bell Pensioners' Group.